Publisher: The Bodley Head, 1966. Hard Cover, 238 pages, 6.00 x 8.75. A good, though not-too-often seen, book on the story of malt liquors in England. 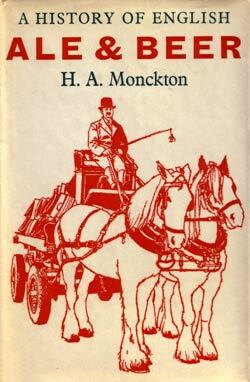 From the dust jacket: "In a lively, witty book, richly laced with anecdotes, Mr. Monckton chronicles ale and beer through every period of English history, through every county and shire, from royal court to village inn. He explains the importance of the Assize of Bread and Ale in 1267, and of bride-ales, inn tokens and the changing shapes and materials of drinking vessels. The book ends with supplementary material which includes beer consumption figures for the past three hundred years."